I just received an email from Quest Software. 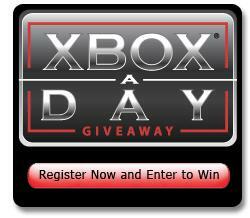 Quest is giving away 15 Xbox 360™ game systems in 15 days! Download a free trial of Spotlight® on SQL Server Enterprise and you'll be automatically entered into the Quest "Xbox-a-Day Giveaway" drawing. Now you have a chance to win the Xbox 360™ and detect, diagnose and resolve database performance issues with ease—just by trying Spotlight on SQL Server Enterprise. What is Spotlight on SQL Server Enterprise? Spotlight on SQL Server Enterprise is an award-winning database diagnostics tool that can help you ensure data availability and prevent problems before they occur. Spotlight not only monitors the SQL Server Environment, but the underlying operating system on which it resides. From an overview screen, DBAs can view the most active SQL Server sessions, SQL statements, Replication information , blocks, deadlocks, waits, and disk activityto pinpoint and alleviate problems before they occur before and seriously impact end users. Where and when are the performance bottlenecks occurring? I will be working four days a week only until next year. 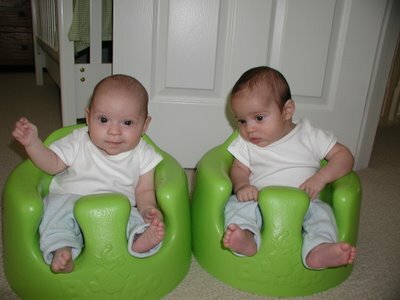 I did not take a vacation this year since my wife was pregnant with twins. We couldn't go anywhere because the due date was the first week of August; twins usually arrive a couple of weeks earlier. Since we didn't know the exact due date and had to go for monitoring every week we decided not to go anywhere. the end result is that I have 8 (out of 10) vacation days left. So I will be taking wednesdays off until 2007. I used to live in the Netherlands where everyone has five weeks vacation. So when I came to the United States I was surprised that there was not a law like that here. Besides the five weeks of vacation in Holland you also get 8% of your salary as vacation money. So when you go on vacation you can use that as spending money. So what does this have to do with Halloween? Nothing really. 20,784 records in the test. 1. Using the current trigger I canceled the update after an hour and eleven minutes of running. It had updated 10,218 rows. 2. Using the set based trigger it ran in eleven seconds and generated the correct amount of history. That's really something to me! Thanks again!" I have difficulty picking a movie to watch on Halloween. Did any of you (my readers) see any of these movies below? Which movie would you pick? Leave me a comment or send me an email by using the Contact Me link. Microsoft Corp. today announced first quarter revenue of $10.81 billion for the period ended September 30, 2006, an 11% increase over the same quarter of the prior year. Operating income for the quarter was $4.47 billion, an 11% increase compared with $4.05 billion in the prior year period. Net income and diluted earnings per share for the first quarter were $3.48 billion and $0.35 per share. For the same quarter of the previous year, net income and diluted earnings per share were $3.14 billion and $0.29, including a $0.02 per share charge for certain legal charges. Server & Tools revenue increased 17% over the comparable quarter in the prior year, reflecting healthy performance for offerings such as SQL Server™ 2005, Windows Server®, Visual Studio® 2005 and BizTalk® Server. SQL Server experienced revenue growth of over 30%, as customers are increasingly deploying SQL Server for their mission critical, transaction-oriented databases. Not bad I guess, I wonder how long it will take to reach 50000? Just saw The Island the other day and I must say I liked it a lot. I don't know why the movie didn't do as well as expected. The stars of the movie are Scarlett Johansson (Lost in Translation, Girl with a Pearl Earring) and Ewan McGregor ( Star Wars: Episode III - Revenge of the Sith , Trainspotting , Moulin Rouge!) other prominent roles are for Sean Bean, Steve Buscemi and Michael Clarke Duncan.. The movie is directed by Michael Bay who did Pearl Harbor and Armageddon. Michael Bay is currently working on The Hitcher and Transformers The links are all to IMDB in case you want more details about any of the movies. The best part of the movie: the car chase. The car chase is probably the best ever; it even beats the one from the second Matrix movie. There is some major product placement in this movie. The Xbox is featured in the movie alongside MSN Search; that's right not Windows Live Search. I guess they can always release a director's cut and 'fix' that. Cadillac has some top of the line car that costs half a million dollars; How much is half a million in the year 2050? To me it seems that a Porsche Carrera would cost about $500000 in about 50 years. Anyway the 'real' Ewan in the movie, who is very rich complains when his 'very' expensive car gets trashed. Would he really get that upset over the car; his clone is more expensive and he tries to kill the clone. Do you use between to return data that has dates? Do you know that between will get everything since midnight from the first criteria and up to midnight exactly from the second criteria. If you do BETWEEN 2006-10-01 AND 2006-10-02 then all the values that are greater or equal than 2006-10-01 and less or equal to 2006-10-02 will be returned. So no values after 2006-10-02 midnight will be returned. 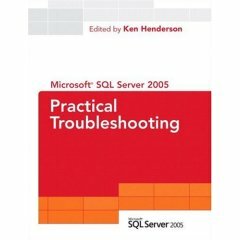 Ken Henderson has posted a sample chapter from the forthcoming book SQL Server 2005 Practical Troubleshooting: The Database Engine on his blog. The sample chapter is: Chapter 4 Procedure Cache Issues. This is a must read for anyone who is troubleshooting SQL Server queries and procedures. Some of the things covered are: Cached Object Leaks, Cursor Leaks, Parameter Sniffing, Excessive Compilation, Poor Plan Reuse and How Cache Lookups Work. I think that this is the first time I have seen parameter sniffing described in a book. Check it out and let me know what you think. Adam Machanic has made available beta 1 of the SQLQueryStress tool. It provides some support for query parameterization and options for collection of I/O and CPU metrics. It is not intended to replace tools such as Visual Studio Team System's load tests, but rather to be a simple and easy-to-use tool in the DBA or database developer's kit. So here we are it's Thursday and since I skipped last week's blog of the week I am giving it to you a day early. The blog of the week is Adam Machanic by Adam Machanic. Who is Adam Machanic? Adam Machanic is an independent database software consultant, writer, and speaker based in Boston, Massachusetts. He has implemented SQL Server solutions for a variety of high-availability OLTP and large-scale data warehouse applications, and also specializes in .NET data access layer performance optimization. Machanic has written for SQL Server Professional magazine, serves as SQL Server 2005 Expert for SearchSQLServer.com, and is co-author of "Pro SQL Server 2005". In addition, he regularly speaks at user groups, community events, and conferences on a variety of SQL Server and .NET-related topics. He is a Microsoft Most Valuable Professional (MVP) for SQL Server and a Microsoft Certified IT Professional (MCITP). Machanic's latest book, "Expert SQL Server 2005," is due out in early 2007. What do I like about this blog? What are some at the posts I like the most? Running sums yet again: SQLCLR saves the day! Separation of user target database settings through user project files, this allows users to work against a different target instance without changing the main project file. And last but not least we fixed many reported customer problems! 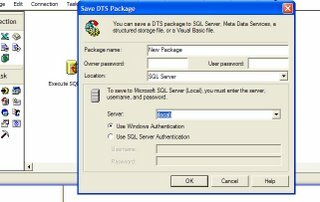 The goal of the SQL Server Hosting Toolkit is to enable a great experience around SQL Server in shared hosting environments. I am having Scrum training tomorrow. So what is Scrum anyway? Scrum is an agile method for project management. Scrum was named as a project management style in auto and consumer product manufacturing companies by Takeuchi and Nonaka in "The New New Product Development Game" (Harvard Business Review, Jan-Feb 1986). They noted that projects using small, cross-functional teams historically produce the best results, and likened these high-performing teams to the scrum formation in Rugby. Jeff Sutherland, John Scumniotales, and Jeff McKenna documented, conceived and implemented Scrum as it is described below at Easel Corporation in 1993, incorporating team management styles noted by Takeuchi and Nonaka. In 1995, Ken Schwaber formalized the definition of Scrum and helped deploy it worldwide in software development. Its intended use is for management of software development projects, and it has been successfully used to "wrap" Extreme Programming and other development methodologies. However, it can theoretically be applied to any context where a group of people need to work together to achieve a common goal - such as setting up a small school, scientific research projects or planning a wedding. Although Scrum was intended to be for management of software development projects, it can be used in running maintenance teams, or as a program management approach: Scrum of Scrums. Scrum is facilitated by a ScrumMaster, whose primary job is to remove impediments to the ability of the team to deliver the sprint goal. The ScrumMaster is not the leader of the team (as they are self-organising) but acts as a productivity buffer between the team and any destabilising influences. A key principle of Scrum is its recognition that fundamentally empirical challenges cannot be addressed successfully in a traditional "process control" manner. As such, Scrum adopts an empirical approach - accepting that the problem cannot be fully understood or defined, focusing instead on maximizing the team's ability to respond in an agile manner to emerging challenges. Notably missing from Scrum is the "cookbook" approach to project management exemplified in the Project Management Body of Knowledge or Prince2 - both of which have as their goal quality through application of a series of prescribed processes. So my question to you is, do you use Scrum? And if you do then did it improve the process of development? We do use it actually but the developers did not get training yet. 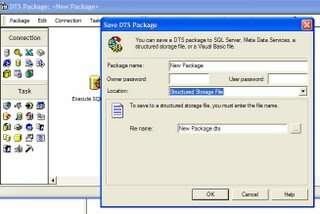 How do I save a DTS package on another server? I have answered this question so many times in the past year or so that I decided to write a little post about it. Most of the times you won't be able to save the file directly on the destination server. The server might be in a DMZ and behind a couple of firewalls. In that case you can save the package as a Structured Storage File. 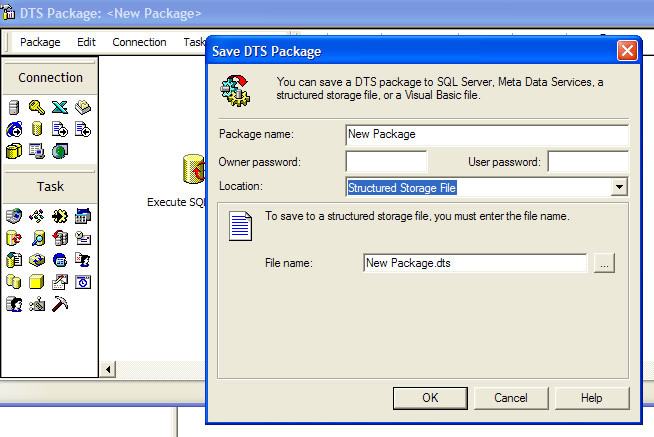 From the dropdown select Structured Storage File (see picture below) Give the file a name and save it in a folder. You probably won't be able to save the file on the destination server, save the file on your own machine or on a machine which the destination server can access. So how did I do this? Well I used this tool called Komodo Unnatural Speaking. This is a chip embedded in a sticker. The chip captures all speech and because it’s a RFID tag whenever my son passes a certain spot in the house the data is downloaded to my computer and the chip is cleared. 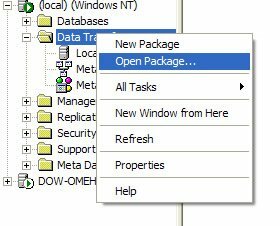 A SSIS package uses Fuzzy Logic to process the data (a toddler’s speech is sometimes gibberish). We get rid of noise words and the results are stored in a table. [columns inherited from sys.columns] For a list of columns that this view inherits, see sys.columns (Transact-SQL). int ID of the object to which this column belongs. sysname Name of the column. Is unique within the object. int ID of the column. Is unique within the object. tinyint ID of the system type of the column. int ID of the type of the column as defined by the user. smallint Maximum length (in bytes) of the column. tinyint Precision of the column if numeric-based; otherwise, 0.
tinyint Scale of column if numeric-based; otherwise, 0.
sysname Name of the collation of the column if character-based; otherwise, NULL. bit 1 = Column is nullable. bit 1 = Column uses ANSI_PADDING ON behavior if character, binary, or variant. bit 1 = Column is a declared ROWGUIDCOL. bit Reserved for future use. bit 1 = Column is replicated. bit 1 = Column has a non-SQL Server subscriber. bit 1 = Column is merge-published. bit 1 = Column is replicated by using SQL Server 2005 Integration Services (SSIS). bit 1 = Content is a complete XML document. int Nonzero if the data type of the column is xml and the XML is typed. The value will be the ID of the collection containing the validating XML schema namespace of the column. int ID of the default object, regardless of whether it is a stand-alone object sys.sp_bindefault, or an inline, column-level DEFAULT constraint. The parent_object_id column of an inline column-level default object is a reference back to the table itself. int ID of the stand-alone rule bound to the column by using sys.sp_bindrule. sql_variant Seed value for this identity column. The data type of the seed value is the same as the data type of the column itself. sql_variant Increment value for this identity column. The data type of the seed value is the same as the data type of the column itself. sql_variant Last value generated for this identity column. The data type of the seed value is the same as the data type of the column itself. bit Identity column is declared NOT FOR REPLICATION. Wouldn’t you rather know there is a problem before you entrust your data to such a complex process? SQLIOSim is designed to generate exactly the same type and patterns of IO requests at a disk subsystem as SQL Server would, and verify the written data exactly as SQL Server would. HOWTO Articles to help you understand our technologies and how you can use them better with .NET. Download the sample browser, utility libraries and source code. Community Resources where you can join our mailing list and discuss the Yahoo! APIs with us and with other .NET developers. From the site: "Today, Microsoft is excited to announce the availability of Windows Vista RC2 to Technical Beta Testers, TAP Testers, and MSDN/TechNet subscribers. This new build of Windows Vista offers users a higher level of performance and stability – improving what was established in Windows Vista RC1. We were able to also fix many of your bugs reported from RC1 and implement them for RC2. Thank you to our beta testers for the bugs and feedback you submitted for RC1. The improvement shows as we raised our quality bar even higher! Does anyone else have a different solution than these two or the two in the comments?